This classic design comes with our powerful motor that gives torque and speed that rivals other 450watt brushless motors., It is the same controller and battery that come with our popular STEALTH MT. BIKE. When you look at features, there are a variety of things to consider. One of the first features will be safety. This is where our 629 bike shines. You love that your electric motor will power you up the hill, but what about safety when you are hurling down that mountain? When you are going down that steep slow, you want to have full control of your bike and no regular bike brakes like on cheaper models will work for you. We know this! 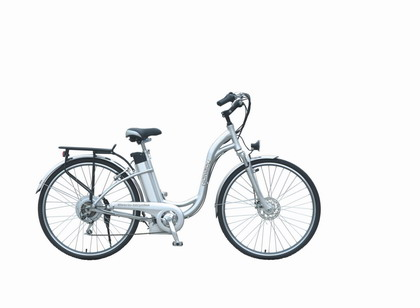 This is why our 629 Step - Through "Swan" bike comes with our front and rear disk brake systems. These give you optimum braking ability for those steep hills. You always have some need for carrying something. We have anticipated this and have the rear carrier built right into this stylish bike. This bike comes in two different sizes. Our 26" size and our 27.5" ULTRA FRAME size for those who are taller and need the size of a bigger cruiser bike. No extra charge for the ULTRA FRAME! This bike has a built-in front headlight and rear light for safety, and also a rear reflector as well. The lights are powered by your powerful Lithium ion battery, you don't have to worry about being seen! With the seven speed derailleur you are not limited to the speed of the electric motor, you can speed down the road as fast you can in high gear! You get the best of both worlds! Exercise and electric assist.